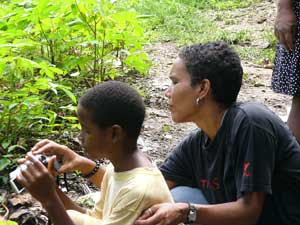 Helping out Jahdiel with the little camera he and his siblings used to film I SPY Things in My Garden. This was late last year - hence the shorter hair. The (Happy Hippy Productions) I SPY series is finished. I didn't talk much about the process on the blog, but I did mention it from time to time. I sourced four groups of children (age 7 - 10) to create environmental documentaries: I SPY Wildlife, I SPY Recycling, I SPY Things in My Garden, I SPY Trees. The children shot the docs themselves, under guidance from me. Each doc is approximately 12 minutes long. The project was made possible by some funding from the Trinidad and Tobago Film Company (I was one of the recipients of TTFC's 2006 grant), British Gas and NIHERST. The latter funded an entire episode. It is great getting funding for projects, even when (as I've said before), it is a matter of spreading the butter (funds) for one or two slices over the entire loaf. I'm happy with what the children did and how it turned out. Now that the creative part is over ... here comes the part I don't consider myself to be very good at and wish I had someone to do it for me. Aaargh. The part that has to deal with getting sponsorship for duplication of the DVD containing all four episodes, effectively marketing the product, etc. and basically seeking the best avenues for it so that it doesn't just sit on a shelf gathering cobweb. congratulations for having accomplished this project. I wish you were provided with big packs of butter. Wish there was someone to do the unloved part of the work for you - you deserved that!